There is obviously a stake missing on the left side of the photo. I have been asked to clarify the situation where a player is not absolutely sure whether their ball lies within the margin of a water hazard, or not. This can arise when a stake defining the margin of the hazard has either been wrongly positioned or is missing. When the margin of a lateral water hazard is defined by stakes, the stakes are inside the lateral water hazard, and the margin of the hazard is defined by the nearest outside points of the stakes at ground level. Q. Stakes defining the margin of a water hazard were improperly installed. As a result, an area which clearly was part of the water hazard was outside the stakes and, thus, technically was outside the hazard. A player's ball came to rest in water in this area. The player claimed that, in view of the alignment of the stakes, his ball was in casual water through the green. Was the claim valid? A. No. The Committee erred in not properly defining the margin of the hazard as required by Rule 33-2a, but a player is not entitled to take advantage of such an error. Since it was clear that the place where the player's ball lay was within the natural boundaries of the water hazard, the claim should not be upheld. Lines and stakes defining the margins of a water hazard should be placed as nearly as possible along the natural limits of the hazard, i.e., where the ground breaks down to form the depression containing the water. (iv) obstructions and integral parts of the course. If your Committee is guilty of incorrectly positioning the stakes around water hazards, or if there are stakes missing, you should immediately bring it to their attention, for the benefit of other members and visitors playing the course. The above content is strictly copyright to Barry Rhodes © 2013 and may not be copied without permission. I read this post with great interest as it touches on certain conditions at our course. On one hole there is a 30-degree sloped bank with a creek at the bottom. The fairway is just a few yards from the top of the bank. It is approximately 50 feet from the top of the bank to the creek. The placement of the hazard stakes has been an issue. At one time they were fairly close to the creek and have been gradually moved upwards toward the top of the bank. However, they are still 20 feet from the bank's top. (The fact that the bank's slope contains several large trees only adds to the golfer's problems). With only these words to describe the hole does it sound to you like the hazard stakes are properly placed? Wouldn't it make more sense for the stakes to be placed at the top of the bank so that a golfer can have level stance for their dropped ball? I can only assume that the current placement of the stakes is to prevent "rewarding" a golfer whose shot is dramatically off line with a drop that is virtually in the fairway. Thank you for any advice you could offer. From the information that you describe it does seem that the stakes are incorrectly situated, but I am not a course expert. There is a section in the R&A publication,'Guidance on Running a Competition' which provides a little more detail on the subject of the placement of red stakes on lateral water hazards. Here is a link; http://www.randa.org/en/Rules-and-Amateur-Status/Guidance-on-Running-a-Competition.aspx?chapter=3&section=2. My other recommendation is that your Committee requests assistance from their national golfing association, who should be pleased to give their advice, as it could affect the standard scratch for the course. Thank you for your response, especially the reference to the R&A's running of a competition. I'm sending this to our committee with hopes of getting the hazard line changed. Let's say I drive the ball and the ball comes to rest on the left side of the rough, just between the left water hazard and the cartpath. Being a right handed player, taking a stance on the water hazard proves quite difficult. However, if I address the ball as a left handed player, my feet are touching the cartpath. Can I state that I'm trying to play the ball left handed but my feet are on the cartpath, then take relief and drop the ball on the right side of the cartpath, under exception of rule 24-2 ? A player may not take relief under this Rule if (a) interference by anything other than an immovable obstruction makes the stroke clearly impracticable or (b) interference by an immovable obstruction would occur only through use of a clearly unreasonable stroke or an unnecessarily abnormal stance, swing or direction of play. So, it is a subjective decision, which one would have to witness to see whether relief was available, or not. Thank you Barry for the clarification. If your natural stance was on a void I would grant you relief, but if it was on ground within the margin of a water hazard I would not!!! 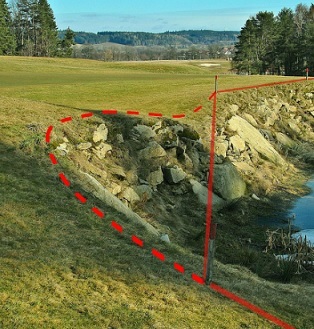 A ball lies within the contour of a hazard (an area which was clearly designed to be a hazard), but not in the hazard as defined by stakes. Can a twig be moved from next to the ball? What about a vine originating from a plant rooted in the hazard? So, neither the twig nor the growing vine may be removed before the player makes their stroke. The Committee erred in not properly defining the margin of the hazard as required by Rule 33-2a, but a player is not entitled to take advantage of such an error. Decision 26/3 suggests ditches are water hazards whether marked or not, and in this decision clarifies that a ditch may be a lateral water hazard. Any suggestions of what constitutes a "ditch", for example when does a piece of ground eroded by storm water run-off become a ditch ? You are misunderstanding Decision 26/3, which only applies in the very limited situation where an unmarked ditch on the left of a hole is in bounds, but the left-hand margin is out of bounds. The Committee must accurately define the margins of all(lateral) water hazards. A ball is in play if it lies in any ditch that has not been defined as a hazard; if it lies in water then the player may take relief under Rule 25-1, as it is in casual water. Thanks for responding. I agree the decision is about a limited situation, and that the committee should define water hazards and lateral water hazards. However, the decision includes the words "... if the Committee has not done so, the ditch is, by definition, a lateral water hazard ..."
My assumption is that the out of bounds aspect is relevant to the ditch being "lateral" and if there was no OOB the ditch would be considered a water hazard. I have also assumed a ball in an unmarked ditch is in play, as you suggest, but the words of this decision contradict that. When I got to #11, I thought "that can't be" and checked the decision on R&A. It seems consistent with the quiz. Apologies, I was thrown off subject by your reference to Decision 26/3. The real crux of your question is, what constitutes a ditch? The best answer that I can give is that it is any natural or artificial channel through which water regularly flows. It does not necessarily have to contain water, but it must be expected that water will flow along it at some time. I have looked at #11 in the quiz that you reference and I agree with the answer, though I think that it is an unhelpful and confusing question for most readers. They do call it a "ditch" and they do say that it is "nearly dry", suggesting that it is a water course and is therefore a water hazard. However, it should obviousl be marked as such by the Committee to avoid the inevitable confusion. Thanks for the follow up. Sorry to harp on, but I can see confusion continuing here. You are right that I was basically trying to understand what constituted a "ditch". The dictionaries I have looked at suggest they are dug for drainage. On my regular course we have a couple of ditches dug specifically for managing run-off during heavy rain and are dry most of the time. They are not marked as hazards. In my observation on the odd occasion when there is water in them it is treated as casual water and relief taken, otherwise people just play the ball as they find it. Clearly, most rely on the committee having defined the hazards and do not know this obscure interpretation. Combining the definition of water hazard with rule 33-2.a (... must define...), I find it difficult to interpret how some other part of the course can be a water hazard. That implies we do not trust the committee has done its job. Can you clarify how you read the rules that this can in fact happen? You must address your query to the Committee. They should either mark the ditches, as a water hazard, or put up a notice saying that the ditches are in play, which means that players have to play out of them if they are dry, or take relief from the abnormal ground condition if water interferes with an intended stroke. There is no point in referring to a dictionary, or me, for answers to the confusing sitaution that the members face. It is the Committee's responsibilty to properly define the course. In the absence of a definition in the rules themselves, where else would you understand what constitutes a "ditch"? The committee might put up a sign for a particular situation but it doesn't solve the broader problem. Can you explain how you read rule 33-2.a together with the definition of water hazard to decide an unmarked ditch can be a water hazard ? We seem to be going round in circles on this issue and this will be my final response. I have already explained that my understanding of a ditch in the Rules of Golf relevant to water hazards is "any natural or artificial channel through which water regularly flows." Rule 33-2a is the Committee's responsibility to mark all water hazards, but if an obvious ditch is not marked, e.g. stakes have wrongly been removed, or it is an area of the course that is seldom in play, the player may treat it as a water hazard, or a lateral water hazard if it is not possible to drop a ball behind it, as per the option in Rule 26-1b. In the latter circumstance the Committee should introduce a Local Rule worded similar to this, "All unmarked ditches/ponds are lateral water hazards. The margin of such a hazard is defined by where the ground breaks towards the hazard." Barry, if a red hazard is marked on an area which does not satisfy the rules of golf for a water hazard or lateral water hazard, eg the Committee has incorrectly marked an area of GUR with red stakes, is it nevertheless to be played as a hazard? if a ball is plugged in that area, and another local rule is that plugged balls may be lifted and dropped through the green, can it be so lifted and dropped? And if not, but the ball needs be lifted to identify if it is your ball, must you then push it back down in the plughole? You have to play the course as you find it. So, in the circumstance that you describe there was no relief for an embedded ball and you must replace the ball in the same lie when you have properly identified it under Rule 12-2. I presume that you did report the wrong course marking to the Committee at the end of yourb round, so that they can correct their mistake.